Welcome to my review of the Celestron Landscout 12–36×60 Spotting Scope. Celestron is well known for its telescopes, but the company also manufactures other types of glass, including spotting scopes. The Landscout features a 60mm objective lens, with an angled eyepiece for comfortable viewing. Let’s check out the spotting scope and see how well it performs. What Comes With the Landscout? The carrying case is nice, but the rest of the included accessories are sub-par. The lens caps are flimsy and cheaply made, and probably won’t last very long. The tripod is almost useless, because it lacks levelers on the legs and doesn’t have a lockdown for securing the scope from panning. The base plate on the tripod is complete junk, wobbling enough that the spotting scope is virtually unusable at distances greater than 200 yards. The 60mm objective lens Celestron uses allows for magnification from 12X to 36X, an excellent range for spotting wildlife or sighting in your rifle. Note, though, that if you want to sight in beyond 200 yards, the magnification on this model might not be strong enough for you. 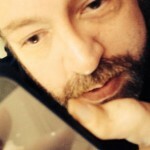 The quality of the image is decent enough, with good crispness and vibrant colors. Eye relief is a bit lacking on this model, 14mm to 18mm. If you wear eyeglasses, this might not be the spotting scope for you. The field of view is somewhat limited due to the small objective lens, but it still allows you to see from 84 feet to 157 feet at 1,000 yards, depending on magnification. How Difficult is This Device to Use? This particular spotting scope is quite easy to use, because both the focus wheel and magnification ring are plentifully knurled to make them a pleasure to operate, even if you’re wearing gloves. The angled eyepiece allows for easy viewing without craning your neck, even when you’re pointing the scope upwards to spot birds. The tripod mount for the spotting scope rotates, so you can place the orientation of the eyepiece in the ideal position for your needs. How Well Does the Celestron Landscout Gather Light? The area that Celestron really misses the mark here is in the light-gathering capabilities of the spotting scope. The Landscout only has fully coated optics, not fully multicoated, so you definitely miss out on some of the potential ability for the large objective lens to draw in light. This spotting scope is terrific in daytime conditions, but under low lighting or at night you won’t find it such a pleasure to use. This isn’t exactly the ideal choice for astronomy, obviously, as it has a twilight factor of just 46.5. 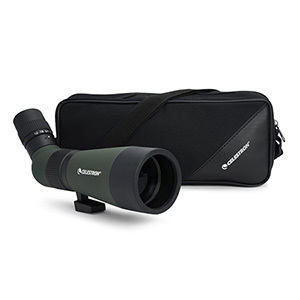 Celestron’s Landscout 12–36×60 spotting scope utilizes a roof prism design, unfortunately with BK–7 prism glass. The manufacturer doesn’t stipulate whether or not phase correction coatings have been applied, but I haven’t noticed much phase shift in the image, so you should see excellent color reproduction, resolution, and contrast. Focus is achieved using a large focus wheel, which turns smoothly but offers enough resistance so that you can be sure of it staying where you set it until you definitely intend to adjust it again. The chassis of the Celestron Landscout spotting scope is rugged, and the entire device is rubber-encased. It’s lightweight, but solid enough to handle a bit of a beating. The controls are placed intuitively and ergonomically, making the device easy and pleasurable to use. How Durable is the Landscout? The rubberized exterior on this spotting scope makes it shock resistant, and the glass is also both waterproof and fogproof), due to the use of O-ring seals and nitrogen purging. Mine’s taken a dunk or two on several occasions without problems, and I’ve also used it in extremely cold northeast Ohio weather without it fogging up on me. Thanks for stopping by and reading this spotting scope review. Celestron’s Landscout 12–36x60 model is an excellent starter glass, and is great for spotting wildlife or shots from as far away as 200 yards. If you want to spot from much further, though, you may want to choose a model with a bit more magnification. You’ll definitely want to replace the almost worthless included tripod.